Passed away on 12.4.19. Loving brother to Pauline, brother-in-law to Brian, uncle to Kim, Lea-ann, Amanda and Karen. 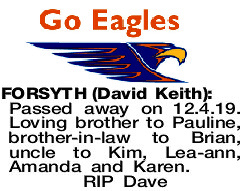 The Funeral Service for the late David Keith Forsyth, formerly of Egan Street, Kalgoorlie will assemble at the Main Entrance of the GOLDFIELDS Crematorium, Memorial Drive, Kalgoorlie for a Cremation Service at 2.00pm on WEDNESDAY (1.5.2019).